Fox’s Pi Day 2016 for Oconee Food for Kids! Mark your calendars to join us on Monday, March 14th for our annual Pi Day tradition! All 12″ cheese or one topping medium pizzas will be only $3.14 each on Pi Day, 3/14/16 only! This will be a fun opportunity to enjoy your Fox’s favorites at the deal of the year! Pi is a symbol that represents a special mathematical number rounded to 3.14, making 3/14 each year a special day. Limit 3 Pi Day pizzas per customer, can’t be combined, no cash value. Pre-Order your big pizzas for the big game today, and let us provide all your party food favorites on your schedule this Sunday! 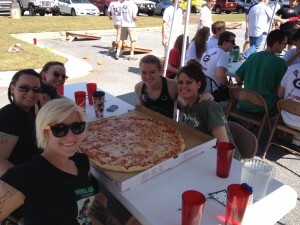 Our 30″ “Biggest Pizza in Town” Big One pizza is the perfect party pizza, and feeds approximately 10-20 hungry fans. Feel free to pick up your favorite gourmet pizzas, calzones, pastas, salads, subs, wings and more at Fox’s, or we’ll bring the party food from our den to your den! Looking for something new and delicious? Give Veggie Power a try! You’re welcome to order on gameday as well. Sunday, 2/7/16 only, enjoy these gameday specials by calling, ordering at Fox’s or ordering online! Enjoy any 14″ large 1 topping pizza with your choice for 8 wings for only $19.99! Need more pizza? 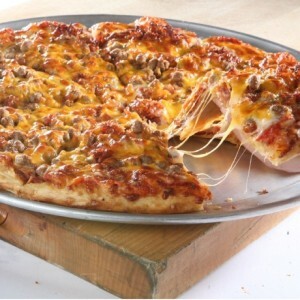 Select our Big Daddy pizza Double Deals… any two up to two topping 21 slice Big Daddy pizzas, only $33.99! We’re excited to announce that a new neighbor is opening next door to Fox’s this week! Our friends at Premier Twirl, Dance and Cheer will have a class for all your needs, birthday party options, and more! Learn more about Premier at their website! Fox’s will have exclusive offers for Premier birthday parties, and members of Premier will receive exclusive special and insider events, so be sure and join the fun today! Photo above courtesy the Premier web page. We’re happy to announce a partnership with the Oconee County Chamber of Commerce to bring current 10th and 11th grade students a unique leadership opportunity! 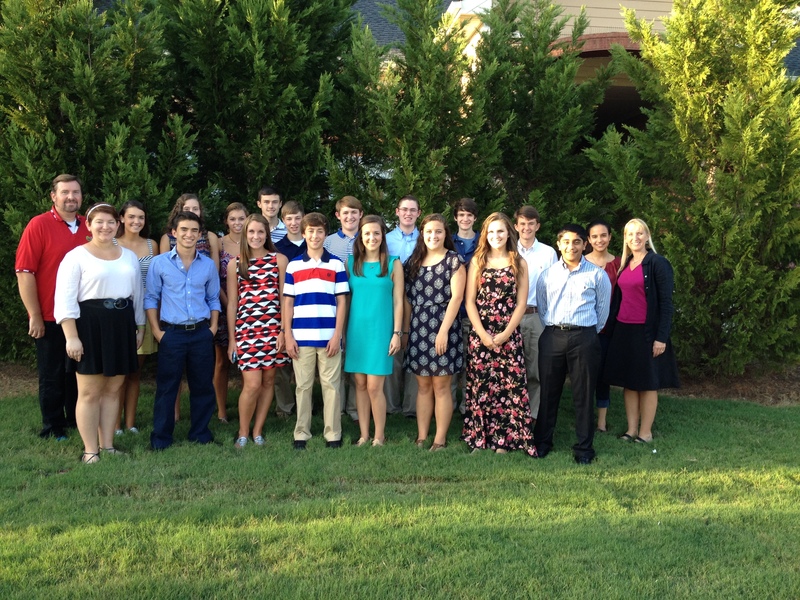 Fox’s will be facilitators of the 2015-2016 Youth Leadership Oconee program, which will include an opportunity to students to participate in a Fox’s focus group and special project team. The leadership program will also include the most important facets of the Fox’s Junior Advisory Board that has been provided to students in past years. Application deadline is September 4th. 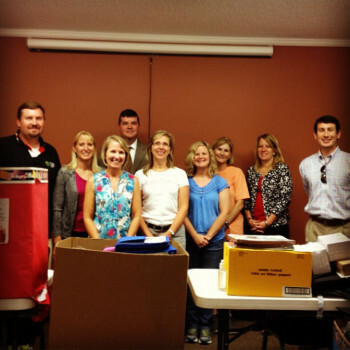 Get more information on the programs and sign up at the Oconee County Chamber application page. We are looking forward to this combined program, and look forward to getting started in October! Join us in support of the North Oconee Titan Twilight 5k and fun run fundraiser this Saturday, August 8th! Check in begins at 4:30pm, with the 5k starting at 7pm. Fox’s will have a tent, and Frankie the Fox’s Pizza fox will be on site. Stop by and enjoy some delicious pizza, and get your photo with the fox. Frozen yogurt will also be available for little Titan participants! You can register online, or the day of the race. All proceeds benefit Titan athletics. 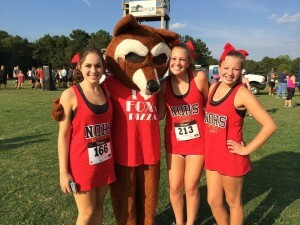 Fox’s is happy to support all our area schools, and would be happy to be at your next event too! Give us a call 678-661-0220 and we’ll start your planning process. We look forward to seeing everyone on Saturday! The 2015 Athens Banner Herald Readers Choice Award voting has started, and we would really appreciate your votes for Fox’s daily and as much as possible! As a small community restaurant, we’ll need everyone to come together and vote Fox’s in categories like best kept secret, buffet, family restaurant, Italian, pizza, caterer and more. Your community businesses work hard to earn your support, and this is a great way to recognize your favorites! 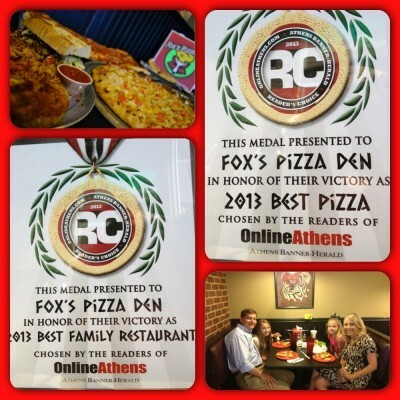 Please vote Fox’s, as well as other area restaurants and businesses that you love in the Athens and Oconee area. We appreciate your support over the past year! You can vote at the ABH page http://www.ReadersChoiceAthens.com. As a special bonus, show that you’ve voted Fox’s the next time you visit and receive one FREE self serve frozen yogurt! Voting continues through August 2nd. We hope to see you soon, from our den to yours! 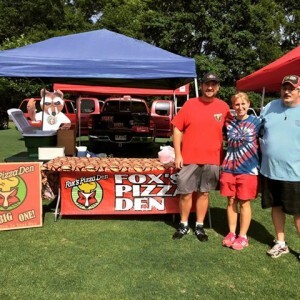 Fox’s celebrates 8 years in Oconee with 8/8 pizza special! Thank you to the Athens and Oconee community! We at Fox’s are so appreciative of your support over the past 8 years. We have enjoyed getting to grow up with your families, and be a part of special events and promotions along the way. We would like you to join us on 8/8/15 to celebrate our 8th anniversary. To commemorate the occasion, we’re going to offer an exclusive 8/8 special on our Fox’s 8 slice medium pizza! Saturday, 8/8/15 only, receive any one 8 slice medium pizza for only $8! 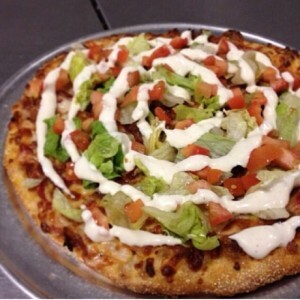 Stick with the basics of cheese or pepperoni, or try something different like our signature Chicken Rancher pizza, with diced tomatoes, grilled chicken and cheddar cheese over 100% Real cheese and our ranch sauce. Limit one 8th anniversary pizza per customer. Please help spread the word about this fun event, and we’ll be adding additional events along the way. Thanks, from our den to yours.